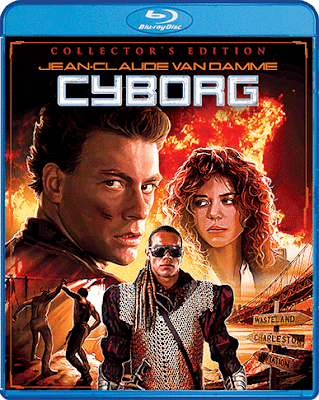 The 1989 cult classic Cyborg, starring Jean-Claude Van Damme, and directed by Albert Pyun (Mean Guns) is coming to blu-ray, as a Collector's Edition, on April 24th, 2018. Jean-Claude Van Damme stars as the future's most fearsome warrior in this adrenaline-charged sci-fi thriller. Deteriorating from a deadly plague, 21st-Century America is descending into a barbaric nightmare. Only Pearl Prophet (Dayle Haddon), a beautiful half human/half cyborg, has the knowledge necessary to develop a vaccine. But during her quest to gather data and bring the cure to the world, Pearl is captured by cannibalistic Flesh Pirates who plot to keep the antidote for themselves and rule the world. Now, only saber-wielding hero Gibson Rickenbacker (Van Damme) can rescue her and save civilization. The blu-ray can be pre-ordered from the Shout! Factory store where it will ship two weeks early along with an 18" x 24" rolled poster featuring the newly commissioned artwork.